I have always enjoyed reading J. Sidlow Baxter. He is a middle ground between Reformed and Pentecostal views of holiness. 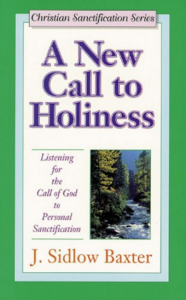 He argues at length against the eradication view of the old nature, but believes that true holiness is really attainable by the person we really are. He writes, “Before all else, even before orthodox dogma, Christianity is life. Holiness, according to the New Testament, is that life experienced and manifested in its purest, deepest, richest, gladdest, fullest qualities.” Sadly, I think Christian interest in a subject such as this has become too sophisticated to care about spending the time.